Angela McGowan, regional director of the CBI: "There is little doubt that this year’s celebration of our Top 100 companies is a true testament to the tenacity and ambition of the Northern Ireland business community." Northern Ireland’s top profit-making companies have shown tenacity and ambition to make it into today’s Belfast Telegraph Top 100 Companies, one of the province’s most high-profile business leaders has said. The magazine, published in association with law firm Arthur Cox, charts a dizzying range of successes from Danske Bank at number one with profits of £117m, to Lough Erne Investments — the owner of a company which makes cooked egg products — which came in at number 100 with pre-tax profits of £3.3m. 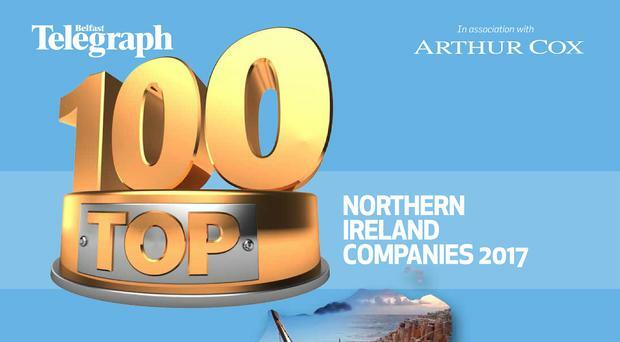 Catriona Gibson, managing partner of Arthur Cox, said it was “extremely proud” to continue its support of the Belfast Telegraph’s Top 100 Companies. And Kevin Kingston, chief executive of Danske Bank, said the bank was “delighted” to retain the top for the third year in a row. “Hopefully it acts as a strong message to the marketplace that Danske Bank is continuing to support the Northern Ireland economy and, most importantly, the ambitions of our customers. Writing in the magazine, Angela McGowan, regional director of the CBI, said: “There is little doubt that this year’s celebration of our Top 100 companies is a true testament to the tenacity and ambition of the Northern Ireland business community. Catriona Gibson added: “We are extremely proud to continue our ongoing partnership with the Belfast Telegraph for a business commentary that demonstrates the effort and strategic foresight being displayed by our highest-performing companies. “As adviser to many of the Top 100 firms, we are fully aware of the drive and hard work of Northern Ireland business leaders as they continue in their pursuit of excellence. “The Top 100 is a welcome opportunity to take an objective look at the performances of Northern Ireland’s most successful businesses. “This year, perhaps more than others, the publication of the league table serves as a reminder of the depth and breadth of talent in the Northern Ireland corporate world, set as it is against a wider backdrop of economic uncertainty. “It is very pleasing to see that the list once again showcases a blend of indigenous firms and multinational companies that have chosen to set up in the region. This illustrates the historic and continued attractiveness of Northern Ireland to foreign direct investors, as well as the talent of home-grown entrepreneurs - both of which are hallmarks of a successful economy. Ms McGowan, Mr Kingston and Ms Gibson will this morning address a business breakfast with guests including leaders of many of the Top 100 companies where the publication was launched.